This is a tutorial related to the L665 course on Machine Learning for NLP focusing on Deep Learning, Spring 2018 at Indiana University. The above output contains for every token in a line the token itself, the lemma, the Part-of-Speech tag, the dependency label, the orthographic shape (upper and lower case characters as X or x respectively), the boolean for the token being an alphanumeric string, and the boolean for it being a stopword. As specified in the code, each line represents one token. The token is printed in the first column, followed by the dependency relation to it from the token in the third column, followed by its main category type. The man said that the woman claimed that the child broke the toy. It is possible with additional effort to translate the Dependency Trees into clauses and reconstruct the clause hierarchy into a relevant form or data structure. SpaCy does not offer a direct data output of such relations. Which car did John claim that Mary took? The embedded clause consists of the sequence [ Mary took which car ]. One part of the sequence appears dislocated and precedes the matrix clause in the above example. Simple Dependency Parsers cannot generate any reasonable output that makes it easy to identify and reconstruct the relations of clausal elements in these structures. Dependency Parse trees are a simplification of relations of elements in the clause. 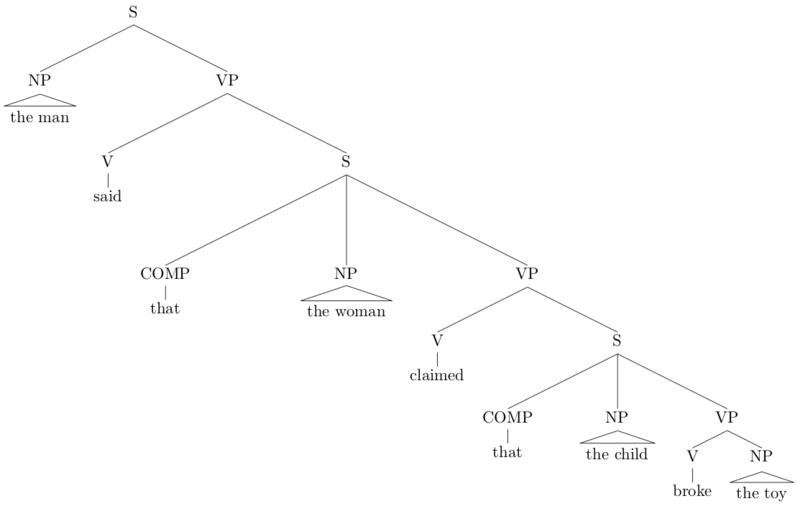 They ignore structural and hierarchical relations in a sentence or clause, as shown in the examples above. Instead the Dependency Parse trees show simple functional relations in the sense of sentential functions like subject or object of a verb. SpaCy does not output any kind of constituent structure and more detailed relational properties of phrases and more complex structural units in a sentence or clause. Since many semantic properties are defined or determined in terms of structural relations and hierarchies, that is scope relations, this is more complicated to reconstruct or map from the Dependency Parse trees. John said that he saw the house. Tim sold his house. He moved to Paris. John saw himself in the mirror. Knowing the restrictions of pronominal binding (in English for example), we can partially generate the potential or most likely anaphora - antecedent relations. This - however - is not part of the spaCy output. One problem, however, is that spaCy does not provide parse trees of the constituent structure and clausal hierarchies, which is crucial for the correct analysis of pronominal anaphoric relations. The CEO of Apple, Tim Cook, decided to apply for a job at Google. Cook said that he is not satisfied with the quality of the iPhones anymore. He prefers the Pixel 2. The constituents [ the CEO of Apple, Tim Cook ] in the first sentence, [ Cook ] in the second sentence, and [ he ] in the third, should all be tagged as referencing the same entity, that is the one mentioned in the first sentence. SpaCy does not provide such a level of analysis or annotation. For various analysis levels it is essential to identify the time references in a sentence or utterance, for example the time the utterance is made or the time the described event happened. Certain tenses are expressed as periphrastic constructions, including auxiliaries and main verbs. SpaCy does not provide the relevant information to identify these constructions and tenses. Visualizing the Dependency Parse tree can be achieved by running the following server code and opening up a new tab on the URL http://localhost:5000/. You can shut down the server by clicking on the stop button at the top in the notebook toolbar. Shutting down server on port 5000.
text = """Apple decided to fire Tim Cook and hire somebody called John Doe as the new CEO. Austin in Texas before the end of the century.""" Apple ORG decided to fire Tim Cook PERSON and hire somebody called John Doe PERSON as the new CEO. GPE They also discussed a merger with Google ORG . On the long run it seems more likely that Apple ORG will merge with Amazon ORG and Microsoft ORG with Google ORG . The companies will all relocate to GPE Austin GPE in Texas GPE before the end of the century DATE . The large model en_core_web_lg contains more than 1 million unique vectors. The attribute has_vector returns a boolean depending on whether the token has a vector in the model or not. The token sasquatch has no vector. It is also out-of-vocabulary (OOV), as the fourth column shows. Thus, it also has a norm of $0$, that is, it has a length of $0$. In spaCy parsing, tagging and NER models make use of vector representations of contexts that represent the meaning of words. A text meaning representation is represented as an array of floats, i.e. a tensor, computed during the NLP pipeline processing. With this approach words that have not been seen before can be typed or classified. SpaCy uses a 4-layer convolutional network for the computation of these tensors. In this approach these tensors model a context of four words left and right of any given word.